What are offloaded apps in iOS 11 and how do they work? 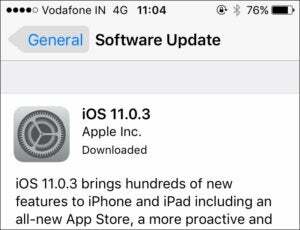 When you install iOS updates from the device itself (as opposed to using iTunes on a Mac prior to iTunes 12.7), the download and installation typically happen as a single operation. Reader Monica is confused by the state of her device after an update failed. Downloaded means a locally cached copy of an invisible installer. It’s a quirk that I’ve seen myself a number of times. You tap Download and Install, but if there’s an error or interruption after downloading, the installation doesn’t happen. This has happened to me when the device puts itself to sleep, even though the installation seems to be in progress. The download is cached, so the device doesn’t have to retrieve the same data again. The downloaded portion is just an invisible installer, which has to execute and perform the actual upgrade. Tapping Install Now launches that downloaded installer and carries out the remainder of the task.